PMEP is thrilled to welcome Katie Nichols as the newest member of our Steering Committee. Katie is the Marine Restoration Director for Orange County Coastkeeper, a nonprofit based in Costa Mesa. At Coastkeeper she designs and implements restoration projects on nearshore habitats in collaboration with volunteers, scientists and agencies in Southern California. Her research interests include resource management and the development of practical and innovative solutions to the challenges facing marine ecosystems. She received her B.A. in Environmental Studies and Marine Biology from UC Santa Cruz and her M.S. in Marine Ecology from San Diego State University. 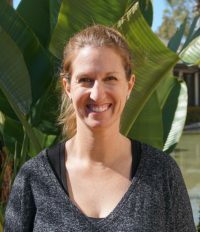 Prior to joining Coastkeeper, Katie worked as a Knauss Sea Grant fellow for NOAA’s National Marine Fisheries Service in Washington D.C., as a project manager with the Sustainable Fisheries Group at UC Santa Barbara, and in fisheries policy and resource management with NOAA in Hawaii and Long Beach. As a member of our Steering Committee, Katie will help guide PMEP’s work as we strive to improve the science and managment behind fish habitat restoration along the West Coast. On October 23-24, PMEP Committee members and key partners met in Seattle, WA to discuss current initiatives and the future direction of PMEP. PMEP is currently updating it’s strategic plan for 2018-2022. Over the two days, the group worked to refine its role in conserving and restoring juvenile fish habitat in the estuarine and nearshore areas of the West Coast. They also began identifying critical initiatives to tackle over the next 5 years. The final updated strategic plan will be release in the Spring of 2018. © 2017 The Pacific Marine and Estuarine Fish Habitat Partnership. All rights reserved.